DAYTONA BEACH, FLA. – Matt Kenseth survived rain, fire, engine overheating and a fast charging Dale Earnhardt Jr., to win the 54th running of the Daytona 500, his second victory in the Great American Race. At the finish line it was Matt Kenseth, Dale Earnhardt Jr., and Greg Biffle. Denny Hamlin took 4th and Jeff Burton rounded out the top five. Paul Menard, Kevin Harvick, Carl Edwards, Joey Legano and Mark Martin filled in the top-ten. Sunday rain pushed the race to Monday and then to late Monday. Drivers nerves were tweaked tighter than a Carolina wino when the race finely went off at 7:00 pm. One lap into the event five-time champ Jimmie Johnson ended up in the outside wall bringing out the first caution. It was a short race for Johnson. The crash set the tone for the rest of the race as drivers threw caution to the wind and drove hard from flag to flag. The second caution came out on lap 13 when Ryan Newman looped his racecar in the middle of the pack. He was able to restart the car and get going. Caution number 5 came out on lap 64 for debris on the track and the next on lap 81 when former champion Jeff Gordon exploded an engine going into turn three shattering his hopes for another Daytona win. Caution 7 flew on lap 89 when Terry Labonte clipped Marcos Ambrose coming off turn 4. Martin Truex Jr., was the leader at the halfway mark and took home the $200,000 bonus. Clint Bowyer brought out the next caution on lap 129 when his car stalled in the second turn. On lap 157 David Stremme blew an engine and spun in front of a small pack of cars and was lucky to come through as the only victim. On lap 157, with the race still under caution, Juan Pablo Montoya had mechanical issues on the backstretch and lost control of his race car. Montoya collided with a jet dryer working on cleaning debris up by the outer wall. The violent crash ruptured the jet-fuel cell which exploded in heavy flame. The event brought the race to a complete stop as firefighters and safety crews quickly went to work to extinguish the fire and protect the racing surface. All in all the cleanup took nearly two hours to complete. When the race resumed on lap 166 Matt Kenseth was the leader and for the next 34 laps nobody presented a serious challenge. There were two more cautions in the closing laps including a multi-car mishap on lap 196 involving Tony Stewart, Dave Blaney, Ricky Stenhouse Jr., Landon Cassill, Kyle Busch, and Ryan Newman. The race ended on a green-white-checker finish on lap 202 with Kenseth, Earnhardt Jr., and Greg Biffle, the top 3 cars. This entry was posted in Motorsports, Slider and tagged Carl Edwards, Clint Bowyer, Dale Earnhardt Jr., Dave Blaney, Daytona 500, Denny Hamlin, Greg Biffle, Jeff Burton, Jeff Gordon, Jimmie Johnson, Joey Legano, Kevin Harvick, Kyle Busch, Mark Martin, Matt Kenseth, NASCAR, Paul Menard, Ryan newman, Tony Stewart on February 28, 2012 by Mickey Mills. Article first published as Kurt K.O.’s the Monster Mile on Technorati. The Monster Mile at Dover can be a mean mistreater. It can chew up a race car, driver and all, and spew out parts for the clean up crew. Sunday’s AAA 400 at Dover International Speedway was a typical day on one of NASCAR’s few concrete tracks. Fast cars, crumpled fenders, temper’s flaring and a come-back win. Kurt Busch gave a nod of appreciation to Jimmie Johnson for a late race pit stop mistake that handed the lead to Busch who took it and stayed there for the last 42 laps. “It was just perfect execution today, with pit stops and with making the car better during the race,” Busch said. “I couldn’t be happier right now. To win a Sprint Cup race in the Chase, this is what it’s all about. This is the playoffs. After a disappointing 22nd place finish last week at Loudon, this win could swing Chase momentum his way. And while KB was fist-pounding and high-fiving in Victory Lane, 2nd and 3rd place finishers, Jimmie Johnson and Carl Edwards were bemoaning their mistakes and wondering what could have been. “I did a really good job, up until those last two [restarts],” Johnson said. “I have to say, when you’re the leader, you have a small advantage, because you go when you want. I blew it by spinning the tires. Kurt got a good launch, and we were door to door going into [Turn] 1, and he was able to get by on the outside. Carl Edwards speeding penalty on pit road was a serious source of frustration for the Aflac team. Kasey Kahne had a good day coming in 4th followed by Matt Kenseth in Fifth. Kyle Busch, A.J. Allmendinger, Clint Bowyer, Marcos Ambrose, and Kevin Harvick round out the top ten. Points leader Tony Stewart struggled on the Dover concrete and went down two laps to finish 25th. Dale Earnhardt Jr. also had a rough outing just ahead of Stewart’s 14 car, also finishing two laps down. This entry was posted in Motorsports and tagged A.J. Allmendinger, Carl Edwards, Clint Bowyer, Dale Earnhardt Jr., Dover International Raceway, Jimmie Johnson, Kasey Kahne, Kevin Harvick, Kurt Busch, Kyle Busch, Marcos Ambrose, Matt Kenseth, NASCAR, postaday2011, Tony Stewart on October 3, 2011 by Mickey Mills. It’s a bit unusual that my NASCAR blog over at Technorati and my Weirdo Wednesday entry here would align in a collage of weirdness, yet here we are. This article first published as Weird Trophies of NASCAR on Technorati. NASCAR Sprint Cup takes a rare week off as teams prepare for one of their biggest races of the season, the Brickyard 400 at Indianapolis Motor Speedway, July 31st. With drivers off doing their thing, crew chiefs working on the cars and race fans readying for the run up to the Chase, finding something worthwhile to write about this week was a bit of a struggle. Then I came across the picture to the right. NASCAR trophies through the years have run the gamut from the tiniest little brass gizmos with no character and little room for the drivers name, to some of the wildest, weirdest trophies in professional sports. Here is a quick look. For winning a race at Martinsville the driver takes home one of the most sought after trophies in the sport – a Grandfather Clock. Valued at over $11,000 the clock is the most coveted trophy in all of NASCAR. Everybody wants a clock and the checkered flag that comes with it. After body-slamming their race-cars around the mile and a half track just a few miles north of the Las Vegas strip, it seems fitting the winner’s trophy looks more like a wrestling belt from the WWE. Dover International Raceway is a treacherous one-mile concrete raceway located on Dover Downs Hotel & Casino property just north of Dover, DE. Somewhere along the way this speedway picked up the nickname, The Monster Mile for the beating it hands out over 500 laps of racing. It was only a matter of time before a trophy came along to reflect its personality. Rumor has it, Thing, of Fantastic Four fame, was the model for this monstrosity. If there’s a rock and roll heaven, they should be lucky enough to have a mondo-trophy like the winner of the Chevy Rock & Roll 400 at Richmond receives. Now if only Alice Cooper would give up golf and take up racing. Carl Edwards looks like a playa! It’s been said that everything is bigger in Texas, even their boots. The winners trophy from the Samsung 500 at Texas Motor Speedway is this homage to Cowboy life. Handguns not included. Win a race at Infineon Raceway in Sonoma, CA, and a bottle of Napa Valley’s finest blush awaits the driver in victory lane. Now that’s the way to chug a glass of wine. This entry was posted in Motorsports, Weirdo Wednesdays and tagged Atlanta Speedway, Carl Edwards, Dover Speedway, Indianapolis Motor Speedway, Infineon Raceway, Jeff Gordon, Jimmie Johnson, Kevin Harvick, Martinsville Speedway, Matt Kenseth, NASCAR, postaday2011, Richmond Speedway, Texas Motor Speedway, Texas Speedway, The Monster Mile, Tony Stewart on July 20, 2011 by Mickey Mills. 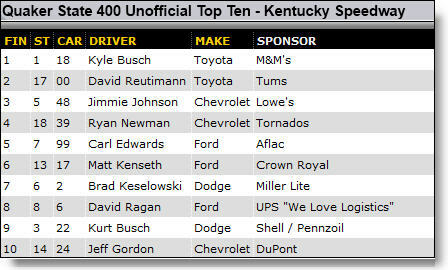 Article first published as Kyle Busch Night at Kentucky Speedway on Technorati. It may have been the first NASCAR Sprint Cup race at Kentucky Speedway but Las Vegas native Kyle Busch drove like he grew up there. He started on the pole and hovered around the top all night long. He led 125 of the 267 laps and became the first driver of the season to win from the pole. Unfortunately the most exciting part of this race was Kyle’s post race burnout. Other than the restart on lap 265 making it a two lap sprint to the finish, this race was about as titillating as a root canal. I’ve had more fun doing my taxes. But that last minute or two was almost a nail-biter. Not so much as who was going to win. That was a given. The real drama played out behind Busch once he pulled away from second place Jimmie Johnson and Kurt Busch in third. David Reutiman poured on the steam and passed both Johnson and Kurt Busch to take second. Kyle’s win was the second of the three Kentucky Speedway events over the weekend. He won the Camping World Truck Series race Thursday night. The strong finish in Saturday night’s race let the Joe Gibbs‘ driver leap-frog over Kevin Harvick and Carl Edwards onto the top of the series leaderboard. Third place finisher Jimmie Johnson said his inability to stay beside Busch on the restart cost him a chance for victory. “I was able to hang with the 18 [Busch] inside of Turns 1 and 2, and he just cleared me going down the back,” Johnson said. “The outside lane had a little bit more momentum coming off of [Turn] 2 down the back. If I could have stayed inside of him, it would have been one heck of a finish. Leaving Kentucky the Sprint Cup Chase shakes up a bit with Kyle Busch leading second place Carl Edwards by four points, Kevin Harvick in third, Kurt Busch in fourth and nineteen points behind the leader is fifth place Jimmie Johnson. Post race interview with Driver Kyle Busch, crew chief Dave Rogers and car owner Joe Gibbs. This entry was posted in Motorsports and tagged Carl Edwards, David Reutiman, Jimmie Johnson, Joe Gibbs, Kevin Harvick, Kurt Busch, Kyle Busch wins at Kentucky, NASCAR, postaday2011, Toyota Racing on July 10, 2011 by Mickey Mills. David Ragan atones for late race mistake that handed the Daytona 500 to rookie Trevor Bayne. Article first published as David Ragan Wins Coke Zero 400 at Daytona on Technorati. David Ragan was out front on the last restart, exactly where he was in February for the Daytona 500. He screwed that one up with a penalty and finished seventh. Not to be denied, the young driver was rock steady and two laps later absolved himself of the spring snafu. Ah, the sweet taste of redemption for the driver of the Jack Roush owned, UPS Ford. It was Ragan’s first win in his fifth season of Sprint Cup. The race itself seemed to have two distinctly different personalities. The first 157 laps had a couple of minor skirmishes resulting in early cautions. Daytona 500 Winner, Trevor Bayne, was knocked out on lap five ending his shot at the Daytona sweep. Points leader Carl Edwards got the short end of an bump from Greg Biffleon lap 23. With heavy damage to the 99 car, Edwards fought to stay in the race. At one point he got very sick in the race car overcome by exhaust fumes. He would finish in 37th, 26 laps off the pace. And then the second part that was more demolition derby than “Gentlemen, start your engines.” Just three laps from the end on lap 157, Jeff Gordon was spun around by slight contact from Kasey Kahne. Gordon made a spectacular save and kept the #24 Chevy off the Daytona wall. On lap 162 the first green-white-checkered finish took off with Ryan Newman out front. Denny Hamlin, David Ragan, Matt Kenseth, Brian Vickers and Kasey Kahne second through sixth. Barely up in turn two the “Big One” unfolded as the field bunched up and race cars turned into pinballs. Joey Logano got into Mark Martin and took a dozen cars with them. On lap 168, Ragan lead the field on the second G-W-C restart with Ryan Newman, Matt Kenseth, Denny Hamlin, Kevin Harvick, Paul Menard, Joey Logano, Kasey Kahne, Jamie McMurray and Juan Montoya in positions two through ten. Ragan stayed out front and would not be denied as the field was crashing behind him. Teammate Matt Kenseth finishes second and Joey Logano took third. Carl Edwards dropped to second in points behind new leader Kevin Harvick. This entry was posted in Motorsports and tagged Brian Vickers, Carl Edwards, David Ragan, Denny Hamlin, Jack Roush, Jeff Gordon, Joey Logano, Juan Paplo Montoya, Kasey Kahne, Kevin Harvick, Mark Martin, Matt Kenseth, NASCAR, Paul Menard, postaday2011, Ryan newman, Trevor Bayne on July 3, 2011 by Mickey Mills.